Dec. 15 – UPDATE: By late today, much of the news was in: REA, ED/EA – and if you didn’t get the results you wanted – whether it was a deferral or a plain “no” – you might be 1. freaking out 2. despairing 3. wondering what the bleep to do next. If you haven’t already heard this, take heart: early applications skyrocketed this year – continuing a climb that’s seen early applications rise up to 30% in the last four years. The competition is ferocious. If you didn’t get the news you wanted and you’re faced with a deferral and/or sending out more applications, there are a few strategic things you can do. Review your application (activities list) and its essays to make sure you’re at the top of your game. Can your Common App essay be improved? Chances are, yes. Are your supplements as strong as they can be? Ditto. Does your Common App activities list do all it can to highlight your strengths? And, if you are deferred, how can you reach out to the admissions office and strengthen your application for when it’s considered again? And … if you haven’t prepared any additional applications and you’re panicking, I can help you through the process. Yes, it’s daunting, but entirely doable. Whether you want to review your application and its essays, reach out to admissions offices if you’re deferred, improve your Common Application essay, or create new essays, I am available for the next three weeks to get you through this nerve-wracking period with my usual focus, experience, good humor, and ability to work with students around the world on Skype and Google Docs. Please email me or phone me for more information. 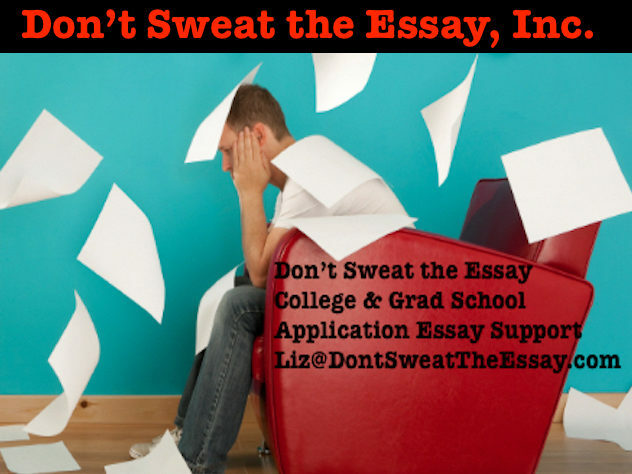 I’m on the East Coast of the U.S. Liz@DontSweatTheEssay.com 1-855-99-ESSAY.